I moved into Rocky Hill Cohousing in Florence, western Massachusetts at the end of August 2017 and I am very glad to be here. I love that people will send out emails asking for all kinds of things, from bananas to send to school with their child’s lunch to cloaks for Halloween. People in this 28-unit community ask for help moving things, getting a ride, and babysitting in an emergency. I enjoy the community meals, monthly meetings, workdays, and the ease with which I can walk across to my neighbor and share food, watch a movie, participate in a book group, or strategize how we will plow the roads together. All of this I thoroughly enjoy. And, I seem to have chosen to live in a predominately white, mostly middle and upper middle class, formally educated neighborhood in a predominately white town. Not everybody shares these characteristics but many do. Though race, class, and gender are braided together and very difficult to separate, for the purposes of this article I am going to limit my comments primarily to class because of my history with Rocky Hill. One of the reasons I moved here is that I know people in the community who are actively involved in climate organizing, peace movement, and anti-racism work. I also know that the community worked purposefully on class issues at the beginning: I had been a co-facilitator of that exploration in April of 2005 with my cofounder of Class Action, www.classism.org, Felice Yeskel. We had worked with Rocky Hill members on class and money issues just as they were breaking ground. 1. To create safety to begin a dialogue around money and class. 2. To better understand and respect each other’s feelings and values about money. 3. To share some of their histories around class and money that may be relevant to their current feelings. 4. To begin to discuss openly their feelings about the money and class differences in the community; including: having vs. not having, spending vs. not spending, giving vs. receiving. This proved to be very useful as it helped members know themselves better and to better understand the history behind opinions strongly held by other members. 1. In what ways do you think people in the community judge and/or make assumptions about you around money and class? 2. In what ways do you judge and/or make assumptions about others in the community about money and class? We asked people to line up according to their self-defined class background when they were 12 years old. This exercise stayed with people: people on both ends of the class spectrum had the courage to step forward and risk feeling exposed. People shared the strengths they gained from their class backgrounds and the limitations—especially as they pertained to living in community. Talk about inequality and power. Explore different values and ideas about money; why do we have them and what are the implications? Look at personal interests versus community interests. Think about the contingency budget—how do we negotiate our different values? Name and explore different kinds of power, not just focusing on financial power. Talk about shame that we carry in relation to money and class. So as I have entered into the community, I am curious about how those conversations have manifested today. Rocky Hill is located in a predominately white town, Northampton, where the median home value is $269,800; most of the houses at Rocky Hill are valued above that. Low-income families, even some middle class families cannot easily afford to move in. The real estate market in the Northampton area seems to be going up every year and it is more expensive to live here than in the surrounding towns. At Rocky Hill we live in a dilemma: we want to be open to anybody who is in alignment with the mission and values of cohousing, but we can’t escape the relatively expensive real estate market that does affect the availability of homes here. Some of the members I have talked to say, “Access was at the center in the beginning—and it was hard to do.” However, there are a number of things that the community has already done and is working on to reduce the costs of being here and to therefore be more welcoming to people with fewer financial assets. Offer homes with a range of size and cost. There are three basic designs for houses ranging from one to four bedrooms, which are charged by the square foot. If one has less money for housing one could purchase a smaller house; more money, a bigger house. Charge for improved square footage. Another way of adding to the community coffers is that people who decide to add on to their condo—building a deck, finishing the basement, adding a screen porch—are charged an initial amount per square foot (that they would have had to pay if the house had been designed with the proposed addition, at the beginning). This acknowledges that the family is privatizing what was previously community space. And people’s condo fees are increased to reflect the additional square footage they now have. Different kinds of additions are charged different amounts. Buy building materials in bulk. Again, at the beginning the originating group made the decision to order materials in bulk or wholesale to reduce the cost. However, a few members now say, in retrospect, that this may have also caused people to design bigger houses with more than they needed for fear that if they decided they wanted something later on it would be more expensive because they would have to pay the retail cost. Sell no higher than the appraised value. There are no enforceable rules about selling one’s house but people are encouraged to sell at the appraised value of the home rather than going to the highest bidder. This is challenging when housing is expensive and people want to take their proceeds and buy somewhere else which may be even more expensive than here in Northampton. Have some rental spaces. A few people have built small apartments in their houses that are rented out, again making it possible for individuals or small families to live in cohousing without buying a full condominium. These members participate actively in the community. Others are renting out rooms to people who are more transitory and not active members of community. We hope to find more ways to engage them. Plan for big expenses. The community is striving to be considerate of people on limited incomes by raising condo fees at a predictable rate for the purpose of building up the reserve fund. The Reserve Fund is specifically for doing large capital projects like replacing roofing, siding, painting, and redoing the asphalt road. The community brought in a professional to help estimate how much money needs to be put aside so when there is a very costly repair community members don’t have to pay an assessment—a large lump sum per household all at once—to cover the cost of the expensive project. Reduce community costs. We do our own plowing, cleaning, leaf raking, and landscaping in general, which keeps condo fees lower. Create and now possibly expand an Affordability Fund. In the beginning the community and a few wealthier families pooled approximately $25,000 into an Affordability Fund, the purpose of which is to help people with down payments for a house. At least three families took advantage of this. The community is now considering other uses for this fund (which is now half its former size) such as temporarily assisting people struggling to pay condo fees or assisting someone to create long-term rental space. This has yet to be worked out. Develop close, mutually rewarding relationships with low-income families. It just so happens that this community is part of a Circle of Care supporting a refugee family from the Congo. And though this is not primarily a financial form of support—it’s mostly the moral and day-to-day support of helping with jobs, transportation, healthcare, setting up a home—all contribute to this newly arrived family’s capacity to live in Northampton while having a close warm tie with this community even though they live outside of the community. Continue to ask the question: How can we be more affordable to those who are currently here and to potential newcomers? We have some members who keep up with what other cohousing communities are doing and people in different committees keep these questions alive as well. All of these ideas are very specific. 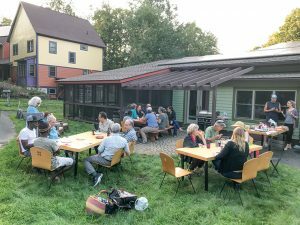 Just as the devil is in the details, the “class issues are in the budget”—and it demonstrates some of the ways that values can be integrated into the system of cohousing operations rather than just being discussed as a good idea. Though class and classism can be addressed in the budget, there is more to the picture than that. The community culture can absolutely reflect class and racial (gender, ethnic, religious, etc.) predominance and marginalization, comfort and discomfort, inclusion and exclusion. Every workplace, community, group has a culture—a set of norms that may be very close to the dominant culture’s norms or may be very different. Culture includes ways of decision making, showing respect, dealing with conflict, food choices, norms about noise, sound, child rearing, humor, manners—on and on. The more we can name and know our class culture the more we are apt to see misunderstandings as cultural and possibly take them less personally. I think it is worthwhile for every group to acknowledge that it has a culture with underlying or hidden rules and then to articulate what those rules are so they are not so hidden to those within the sea they swim or to others who enter the community. We as a community have yet to tackle this! Be clear about the community culture—what are our norms and practices, spoken and hidden. Clarify who we aren’t. Continue to get to know about each other, including our class backgrounds and childhood attitudes towards money that are playing out today in our decision making. Engage in white awareness work as a community. Find ways for those who are renting temporarily to feel as included as possible. Create policy that makes emergency/backup funds available to community members who really need it. Have frank conversations about aging and sickness—how does the community want to be with those who can no longer afford to pay condo fees and live here? Alert community members about city, state, and federal initiatives that enable low-income people to have decent housing so we continue to ground our solutions in the larger town, state, and national context. Get comfortable with being uncomfortable as we explore class, money, and for that matter, race, gender—any of the deeply ingrained dominant patterns in our society. Liberation often requires going through the metaphorical fire of openness and conflict to get to the other side. Every day I have some concrete reason for enjoying being here, much of it having to do with people sharing who they are and what they have with one another. I also know that good intentions to be welcoming across race and class are very, very difficult to really achieve. The weight and momentum of historic/systemic patterns is very heavy. These pockets of experimentation are essential. May we keep on learning, reflecting, and taking action. Jennifer Ladd, Ed.D. is a philanthropic advisor, fundraising coach, and anti-racism/classism trainer. She cofounded Class Action (www.classism.org) with Felice Yeskel. In her consulting work she is dedicated to creating resilient community by helping resources move where they are most needed in a way that serves all involved. I am very drawn to co-housing and also find that the “one family-one house” paradigm is more separating and more expensive than is either appealing or affordable for me. I would be interested to know whether anyone at Rocky Hill has envisioned interconnected condo-type housing units or dormitory-style houses that allow more privacy than typical co-living arrangements, but are simpler (and more affordable) than owning an house. Rocky Hill Cohousing may not see this comment. If Rocky Hill Cohousing does not respond to this comment, we recommend using the contact info at the upper right of their directory listing to pose your question.